Below are examples of what we strive to do with every patient. 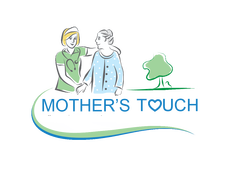 They are not intended to be an indication of results we can promise, but are intended to be an indication of the way we approach caring for every patient. While the stories below are factual they do not have actual pictures of the patients. My first patient years ago was, Doris. When I first met Doris she could not respond to questions, needed to be fed, was incontinent, and was "full care". She was given just a few more months with us all. I noticed some of her numerous medications were indicated to have interactions with some of her others. Others seemed to be unnecessary such as an anti-vertigo (dizziness) medication started five years earlier. This is usually given for an acute (short-term) condition such as an ear infection causing dizziness. by our pharmacist. I discussed his written proposal with the family who wanted to try each suggestion one or a few at a time to adequately monitor the results. After 13 months, she could talk the leg off of a chair, was feeding herself, was no longer incontinent, and doing most of her own care. We signed her off of our services in the middle of all this, but we continued to care for her anyway at our own expense until she declined further. She came back on service at that time because, well, it was what she wanted. When I first met G.W., the V.A. reported to us that he had lost 30 pounds in the last 6 months. He had been diagnosed with cancer and given a couple of months. His weight at that time was 90 pounds. Muscle tone was greatly reduced. Blood pressure was very low and he was drinking only a couple of cans of Boost each day instead of the doctor-ordered minimum of 6. He had lost interest in eating and drinking too. It took G.W. a while to stand up and he was unsteady for a few minutes sometimes when he did. 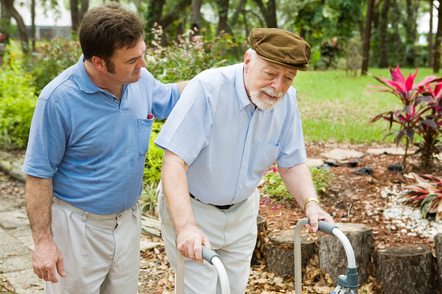 Attempting to stand or walk often resulted in falls and bruises. The fall risks increased at night of course. However, he had to get up and take pain medications a few times a night. This often resulted in falls. He often missed some of his medications and would just drink some of his liquid ones from the bottle instead of measuring them out. This sometimes resulted in overdoses. He was a past smoker but was on no breathing treatments of any kind nor oxygen with blood oxygen saturation I first observed at 87% vs. the recommended 90% or above. He was about to scratch abrasions into his skin from almost constant scratching as a potential result of liver damage. He was afraid to bath for fear of falling while getting into or out of the tub. We could came up with other suggestions and some education goals for G.W. to ask his Doctor about. Here's some of the changes we discussed with him and the doctor and that were implemented. With his "slight" frame at this point, he could not afford reduced nutrition, but especially protein. We educated him about protein and its need for it plus movement to prevent skin breakdown and the dangers of skin breakdown. He and his doctor were willing to try an appetite stimulate which soon caused him to exceed the doctor's nutrition minimum order. He was started on a pain medication that had a consistent level of relief for 72 hours at a time vs. him having to take a medication every 4 hours (and sometimes drinking an overdose of that) which resulted in virtually constant cycling up and down (we call "roller coastering") of his pain and the relief of it. He no longer had to get out of bed at night for pain medications. He retained an "as needed" pain medication to add to his long-lasting pain medication in cases of overexertion or for "bad days". Of course we closely monitored his bowel movements and educated often about the relationships between pain medications, low fluid intake, and bowel movements. 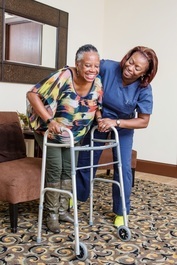 "He had lost 30 pounds in 6 months"
"Falls, pain relief roller coastering, shortness of air, and itching were reduced"
Our Home Health Aide helped him the 2 days a week he requested to bath and he used the shower chair we furnished him for that. and a lung steroid via breathing treatments and a "rescue inhaler" was added to his medications in case of an emergency. We furnished him a pill organizer, a oral medication to reduce itching and a topical for that too. Other interventions were implemented. Falls, pain roller coastering, and shortness of air were reduced. ​​ ​While appetite, fluid intake, strength, pain relief, breathing, medication compliance, personal care, blood pressure and blood oxygenation, strength, steadiness when standing or walking, and fluid intake all increased. ​With Georgia's RN and our Social Worker working together, we were able to help. The family dynamic and how it relates to what we do is a very large and very important part of what we do. It's a reason we need to be involved weeks, if not months, before some think we should be involved. able to facilitate a conversation between the two, to get it all out in the open, and get them to understand each other's place, crying, holding, while we joined in as requested. You know when the day comes when sad news about one of our patients or their family members doesn't make me cry, I think I'll go do something else for a living. ​"Some family members where in denial"
Family members are often in different stages of grief. How they work through those stages, how they understand those and help others with their stages is good for all, but especially Mom. It is a part of serving and caring for the whole family as we should. One family member in particular felt she (a daughter) should demonstrate to Mom that she was never giving up on her Mother "getting better". She wanted more time with Mom and wanted to make sure she did all she could to prolong that time. She also did not want to ever feel guilty that she did not "do enough". All this can be a very typical part of the grieving process. We uncovered this dynamic and were able to facilitate a conversation between the two and get feelings out in the open. They finally understood each other's place while crying, holding, and us joining in as requested. One son did not realize he was coping by being "angry". the family members were upset with the way other family members were acting. Mom being "sick" and eventually passing away was approaching fast. With different personalities in close proximity and being like that frequently around mom, made her feel worse. It was obvious they all loved a wonderful mother very much. We were able to communicate with the family and help them recognize where their true feelings toward loosing there mother really were. Ultimately this brought the family together in this important time. The family said, we made a real impact on helping them through what no one wants to ever go through. ​The stories above are medical or social work related in nature. Those that can be added by our Chaplains, Home Health Aides, and even the office staff can run into the hundreds. It is felt the examples given here, however, demonstrate a little what we do and why we do it. We are glad to do it for our patients and their families. 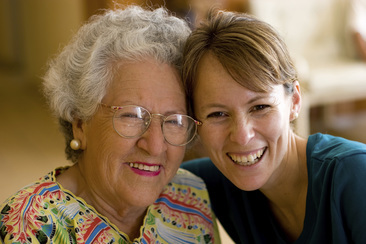 We are here to listen and provide the best care; it is what we do.